Fitness Friday – 10 minute workout! 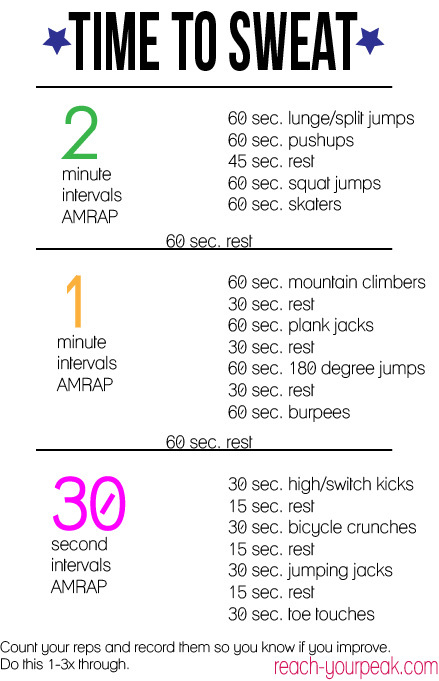 This is a 10 minute workout! Yes, it will only take you 10 minutes to complete. 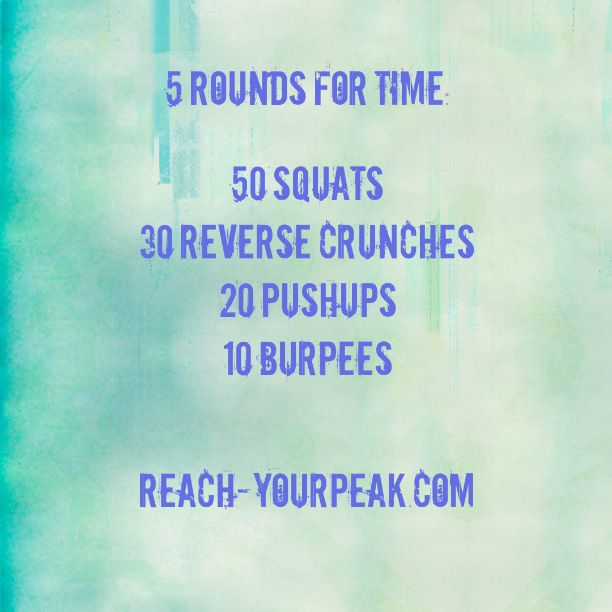 If you’re short on time or just don’t feel like spending an hour at the gym, then try this workout out. There are a few ways you could do it. You could solely do the 10 minute workout (after a proper warm-up of course). Or, you could go for a run or do whatever you want first, then end with this. 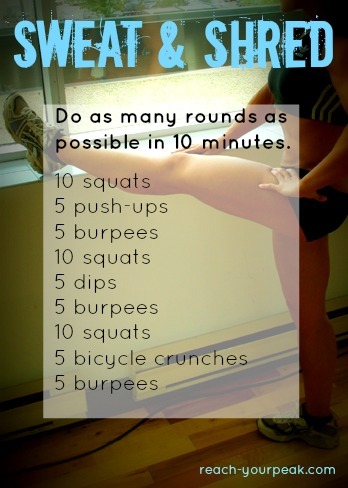 Or if you want to make it longer, simply do it for as many rounds as possible in 15 or 20 minutes. Challenge yourself! 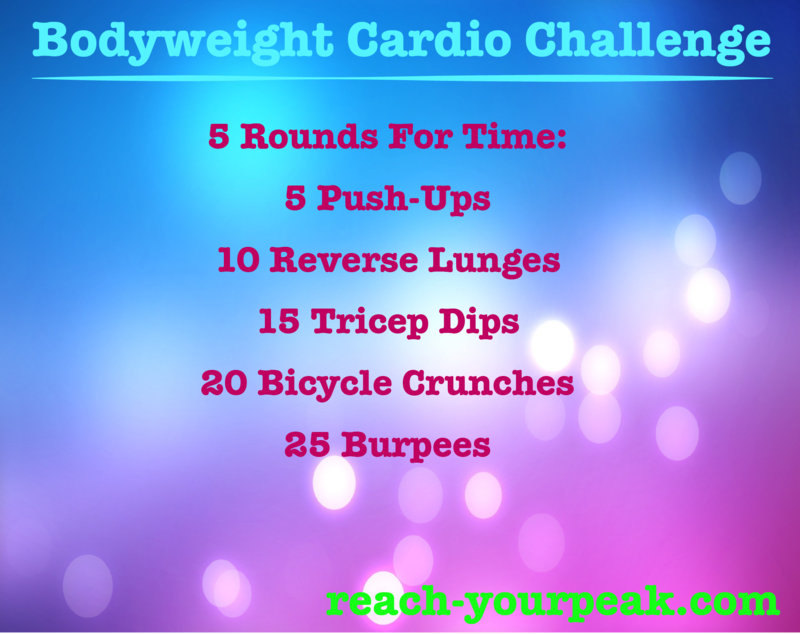 We’re hitting legs, chest, arms, abs…burpees for cardio…this workout has got it all! I’ll be heading to my Maryland tomorrow for my brother’s soccer tournament, so should be a fun weekend. I think we plan on visiting Baltimore for dinner or something. Hope everyone has a great weekend! 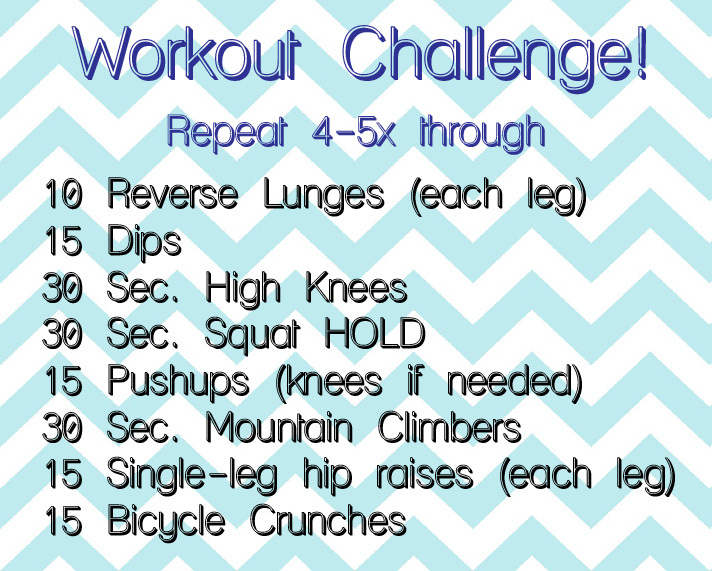 Out of the exercises in this workout (squat, push-ups, dips, bicycle crunches and burpees) which is your least favorite? As I mentioned earlier, it’s yet another snow day here in NJ. I’m going to see if I can drive to the gym, depending on how icy things are. Unfortunately, I don’t have an all-wheel drive car! However, just because you can’t make it to the gym doesn’t mean you can’t workout. That’s why I made this workout for you today, which you can do right at home-no equipment needed. Make sure you have good form for the squats, especially because you are doing high reps. Only go as low as you can go with a flat back. Don’t force it. For push-ups, it’s ok if you have to do them on your knees. Check out my quick, 30 second video on how to work up to full push-ups! Despite bad road conditions, I plan on getting in a workout today no matter what! Do you like doing workouts for time? What are your favorite at-home workouts/workout videos? I’m starting a new series on my blog, called Training With Marc. Marc Pelerin is a running coach, and runs TrainWithMarc.com. He provides runners with personalized plans to help them achieve their goals. Oh and he was also an awesome runner in high school and in college…so he’s got a lot of experience! Visit his website for more info on the coaching he provides. I worked with him for over 2 years and was very happy with the results! Today he will be talking about strength training. Strength training is very important for runners. It helps you to correct muscle imbalances, and avoid injury. Plus, there are great exercises anyone can do even if you aren’t a runner. Without further ado, here’s Marc! Hi everyone! It’s Coach Marc and I’m back. This time I’m writing about my favorite body weight exercises. As always, if you’re unsure of how to do an exercise, ask someone or look it up on the internet. 1. Make sure I’ve been hydrating all day; not just in the 10 minutes before I run or workout. 2. Make sure I’m warmed up. It’s really tough to be strong when your muscles are cold. 3. Have some great tunes or a buddy to keep you motivated. 4. Don’t waste time. Go from one exercise straight to the next. Keep that heart rate UP! OK, now that we have that settled, let’s get into some lifting exercises. Typically, I’d try and do 3 rounds of each exercise. The amount or time I spent on each exercise varies depending on where I am in my training. The reps or times below are guidelines and not the rule. *Beginners should do stepping lunges; transition to a walking lunge; finally, the advanced move is jump lunges. For more tips, tricks, and all things running, be sure to visit trainwithmarc.com. Up for a challenge? Or want to escape the outdoor heat and just work out in your living room? 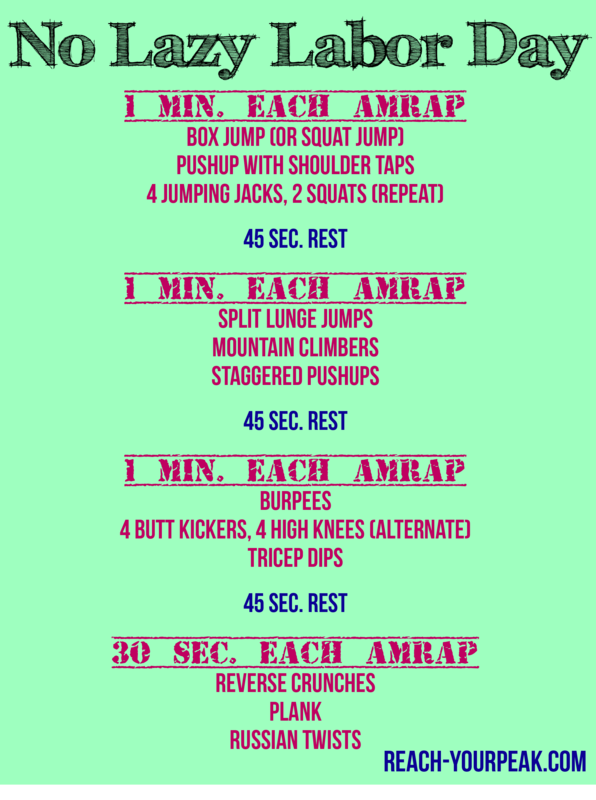 Here is a workout for you! Once you warm up for 5-10 minutes, complete 5 rounds of these exercises for time. Simply go down the list and then start over. If you need a break, feel free to take a break. At the end, write down your time so that the next time you do it you can compare and see your improvements. How have you been beating the heat? Let me know if you try this workout!